‘Four patch units are anything but boring!’ is the opening line of the article in the current American Patchwork & Quilting magazine Issue 133 April 2015. I totally agree with that statement. 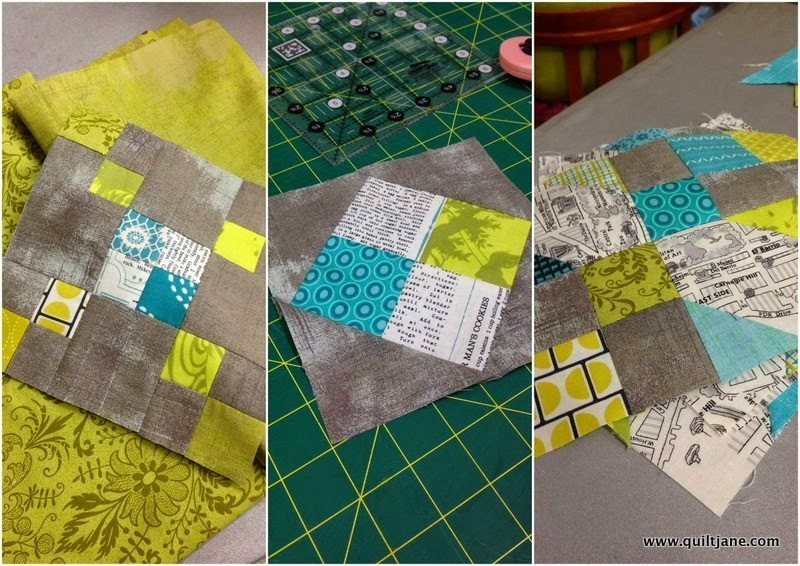 Lissa Alexander, April Rosenthal and Edyta Sitar show how the humble 4-patch block can become fun designs perfect for scrappy quilts. 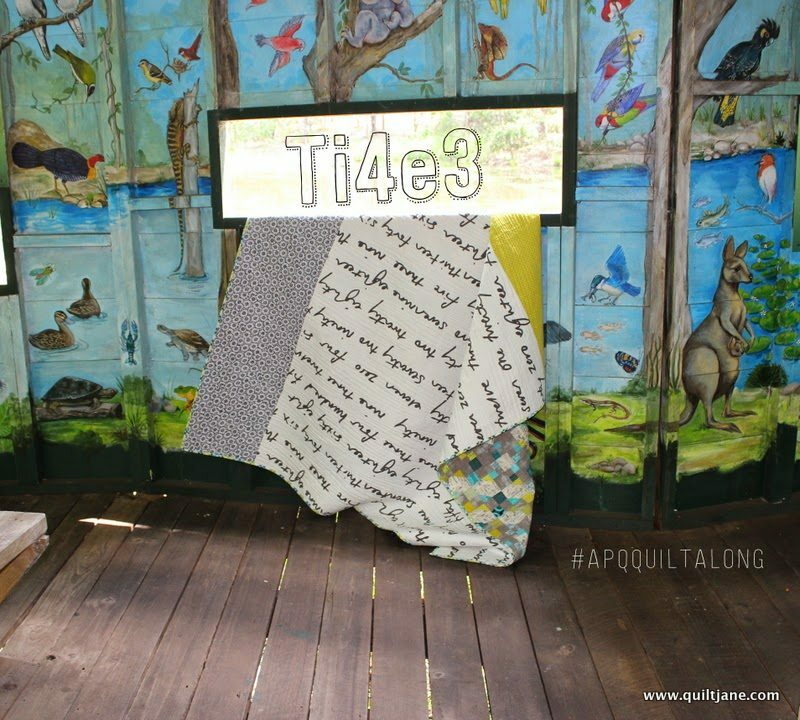 I joined the #APQquiltalong and designed a quilt using all 3 blocks. 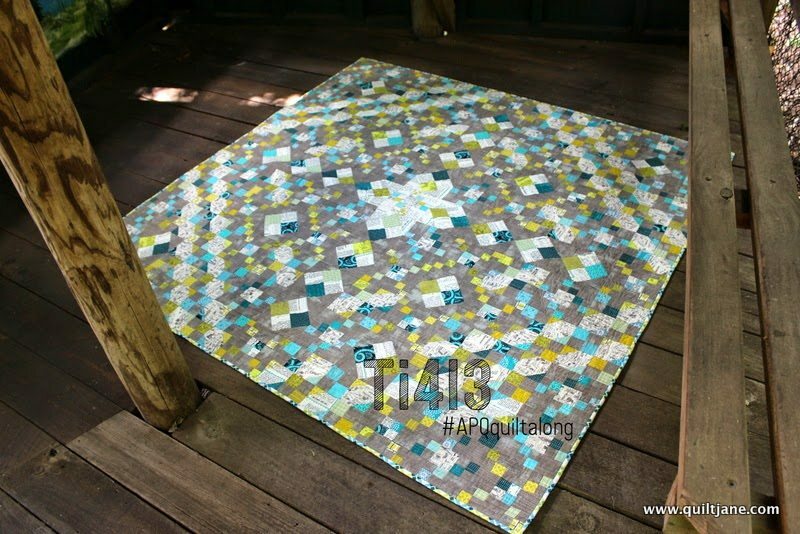 I am fascinated with tiled floors so the layout was supposed to mimic an intricate tiled floor. The background fabric is Grunge (Blitzen) by Basic Grey for Moda. The text prints are a combination of Moda Passport and Sweetwater Feedsack fabrics. The lime greens, aqua and teal prints are a collection of moda (origins / grunge), Denyse Schmidt, Laura Gunn fabrics. The pieced backing was created from scraps I had from other projects. The IKEA text print is my favourite ‘go to’ backing. 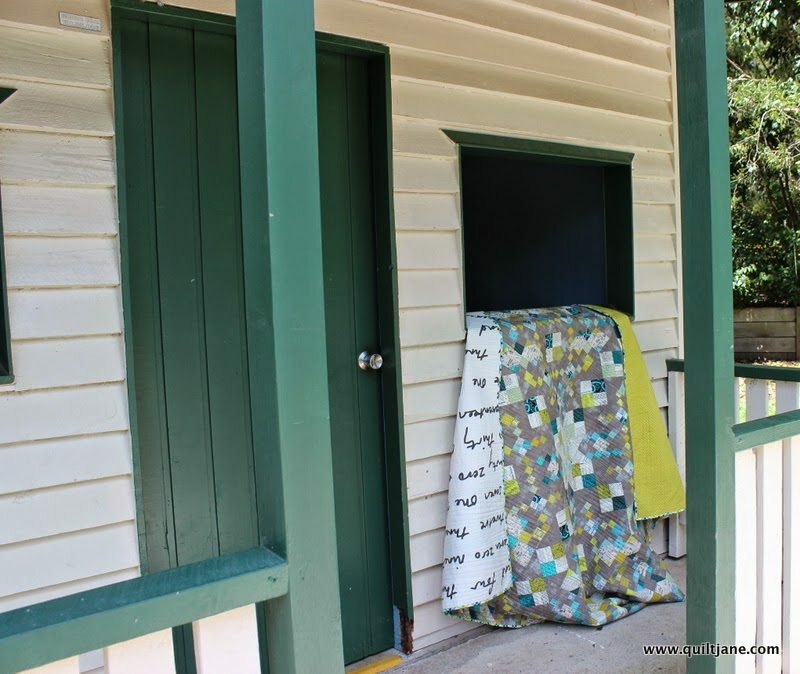 54″ wide and quilts beautifully. 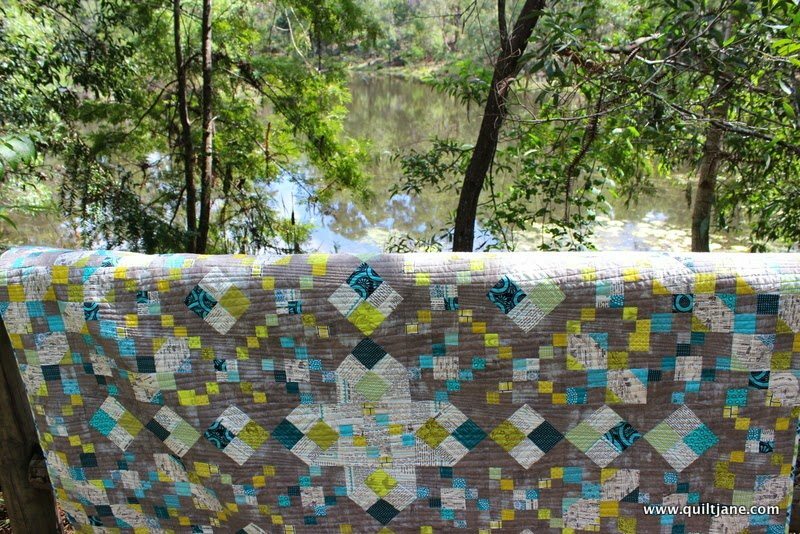 I chose a very simple wavy quilting pattern to add the illusion of movement using Aurifil 2085 light aqua blue 50wt cotton. I used up some old bobbins with colours ranging from light grey to dark teal on the back. Stop by their blogs and see what they have been making. Very beautiful, love all of this quilt . I love the combination of all of the 4 patch designs! An amazing quilt! 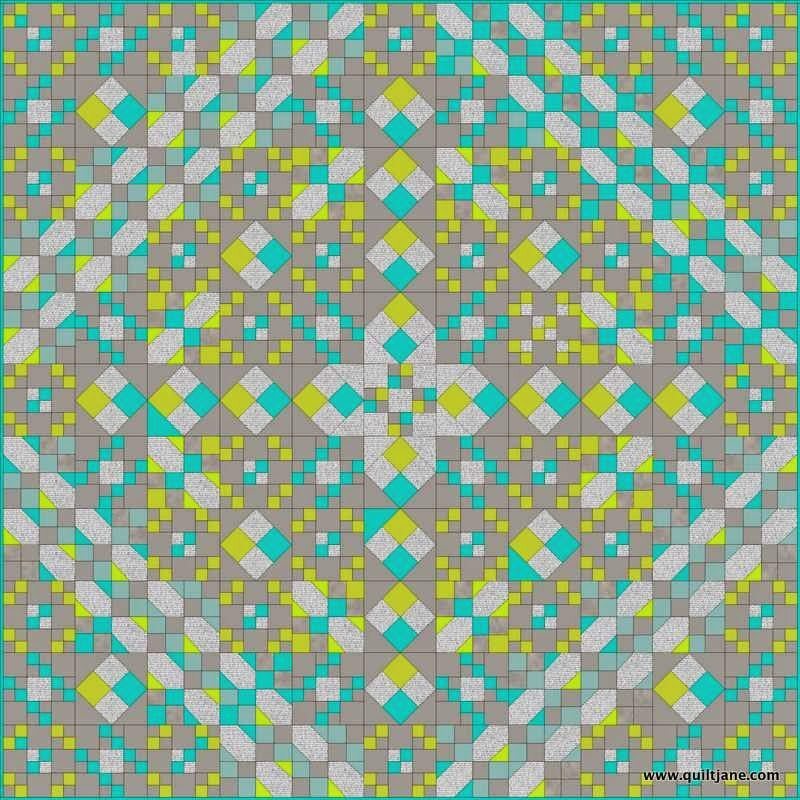 What a beautiful quilt, and how creative to combine the three patterns. I think your color choice is very striking too! I love your quilt! It looks complicated but is made with simple blocks. Beautiful! I think you succeeded the tile floor. I have come back to this one so many times, even though it looks modern and I am more traditional, maybe it's the combo of the fabrics. I keep looking at each fabric and oooohing and ahhhhing, telling myself I must find that one, or this one, so thanks for telling what you used. Love it! It looks amazing!! Lovely quilt! Love the combinations you picked! Absolutely amazing! Wow, you are clever, super work!